This entry was posted in Animals & Zoos (動物と動物園), Photography (写真) and tagged スマトラトラ, トラ, トラの赤ちゃん, photography, sumatran tigers, tiger cubs, tigers, 写真 by T Ibara Photo. Bookmark the permalink. Wonderful action photography! Just as long as they are not running to have the photographer for lunch! It is incredible how fast these cats are. Beautiful! I love the blurring effect here! So happy you liked it! They have grown so beautifully. Thank you, they grow so quickly! Wow, what an awesome action shot Takami ~ the blur of the chase and the capture of their greatness 🙂 It must have been an amazing sight to see. They seem very happy even though moving so quickly. Wishing you the best in the Lunar New Year! A very Happy New Year to you too! So glad you could stop by and spend a moment with these 2 tigers. They are the same cubs from December 2014 – amazing how time flies! They are 1.5 years this month and grown into beautiful tigresses. It was exciting for me to capture a moment of them in action. So playful, so powerful and so majestic. My husband bought me a super-duper (600mm) zoom lens for my birthday in Dec, and it was my first time trying it out. What a whole new world! Hope all is well across the pond in HK, and that you’re not too busy. Wow, I wondered if it was those two cubs…but they look so big now ~ time does not wait for anyone 🙂 Wow, you got a 600mm, that is great…you really need to go to Hokkaido and shoot the birds and wildlife up there, it would be perfect! Plus, it is a great place to just chill and enjoy winter 🙂 Happy Belated Birthday, and you can tell your husband my birthday is in May if he is feeling generous 🙂 🙂 🙂 Cheers Takami to a great New Year! Yes!! Must go to Hokkaido, it’s the irony how I don’t travel enough in my own country 😉 Haha I’ll tell hubby of your birthday wish list! Your recent series of “street life reality” photos are immensely touching. The images haunt me. Well, you can rob a bank…. What a beautiful action shot, Takami!! Wow! woo-hoo! You got ’em Takami! Wonderful! Gorgeous action photo! I hope that You have had great start of 2016. Wow, these kind of pictures are so difficult to make. Great shot, congratulations. Amazing! What a great photo. Such a wonderful photo, so inspiring from a photographic point of view! It was my first time to try out a new zoom lens, and a very exciting moment. 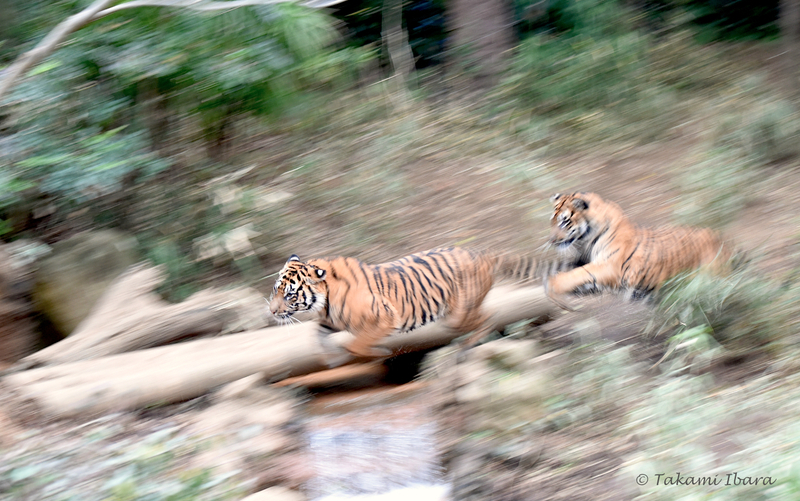 They are beautiful these tigers in full chase. Very beautiful pictures. thank you very much Takami. A very powerful image! Congrats on a beautiful capture. Wow, this photo gives a great sense of speed, power and motion! Lovely. These cats are fast! Great job catching them in mid-flight! Great job tracking the lead tiger with your camera! You’ve created a good sense of motion. What a fantastic gift! Yes, it will definitely put you up close to your subjects. Once you get a feel for it, I’m sure you’ll master the challenges. Oh, and happy belated birthday! It’s so hard to believe they were mere cubs just a little over a year ago. They certainly did their parents proud.